Her operatic debut, in 1966, was at the Mozartsaal in Vienna. In Canada she appeared widely, including with the MSO, the NACO, the TS, the Groupe baroque and Musica Camerata (both Montreal), the Victoria International Festival and JMC Orford Festival, and sang on CBC radio and television. Gabora also performed in the USA and Europe, eg, with the San Francisco, National, and Milan Radio symphony orchestras, and she participated in the Barcelona International, Moscow Winter Nights, and Ravel (France) festivals. In 1965 on CBC radio she premiered Kelsey Jones' Songs of Innocence, which were composed for her. In 1972 she gave the first Canadian performance of Shostakovich's Vocal Instrumental Suite. With her husband, the violinist Taras Gabora, and the pianist John Newmark, she recorded music of Villa Lobos, Hovhaness, Joseph Marx, Murray Adaskin, and Brahms (1974, SM-277). She also recorded Alexander Brott's Songs of Contemplation with the McGill Chamber Orchestra (1967, CBC SM-6), Handel's 'Crudel tiranno amor' and Purcell's 'The Plaint' from the Fairy Queen with the Groupe baroque de Montréal (ca 1977, RCI 449), and for Melodia (Moscow). 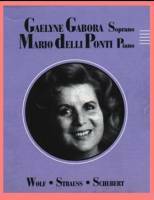 In 1996 she recorded two CDs of lieder with the Italian pianist Mario delli Ponti (LoveLieder G168-1 and G168-2).